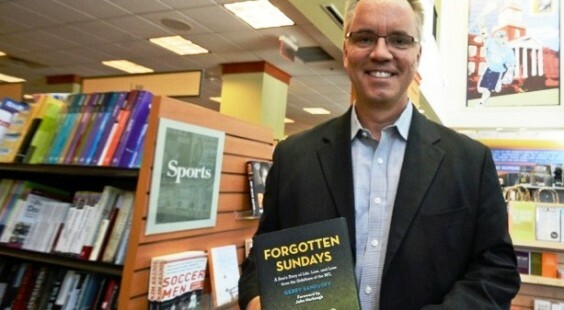 Sports director at WBAL-TV, Gerry Sandusky, made an appearance at Johns Hopkins University’s Barnes & Noble bookstore located at 33rd & St. Paul Streets in Baltimore. He discussed his book, “Forgotten Sundays: A Son’s Story of Life, Loss, and Love from the Sidelines of the NFL.” Sandusky’s father, the late John Sandusky, a WWII veteran was a former NFL player and a coach for three NFL teams, including the legendary Baltimore Colts. John Sandusky played seven seasons as an offensive and defensive tackle during the 1950s for the Cleveland Browns and the Green Bay Packers before starting a 36-year career as an assistant coach. He was head coach of the Baltimore Colts for part of the 1972 season. The book is centered on that very special father/son relationship and how it evolved over the years and the many valuable life lessons that it taught the author.